As noted below, BBC on 25 July published a piece on the Savannah that contained some technical errors. This is the official NSSA response. New BBC Article about "The Ship That Totally Failed to Change the World"
BBC contacted us out of the blue with the notion to do a brief piece sort of talking about the 50th anniversary of the N.S. Savannah's visit to the UK specifically and the ship itself, as well as nuclear powered merchant ships generally. This was a BBC initiative – we had nothing to do with its genesis. Instead, it was important to provide as much factual information as possible and try to steer the story to the truth, which we believe came off as well as can be expected. The press in the UK has not been anything but anti-nuclear for years; seeing a balanced piece like this is actually refreshing. Even if the headline is a thumper. Once Upon A Nuclear Ship...Launched Finally! This new film chronicles the life death and resurrection of this historic ship. Once Upon A Nuclear Ship, a new documentary by filmmaker Thomas Michael Conner, tells the story of the N.S. Savannah the world's first nuclear powered merchant ship that was once the diamond in the crown of the US merchant fleet. Once Upon A Nuclear Ship is being released on DVD through TCL Communications, Inc. and is available on its own website, http://nssavannahdocumentary.com. The Steamship Historical Society of America presents N.S. Savannah with the ship of the year award. The N.S. 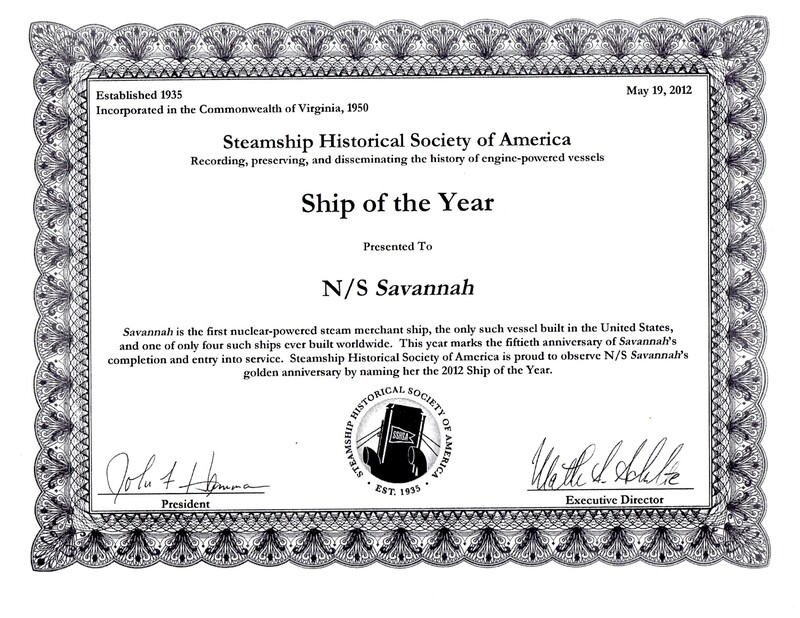 Savannah was presented the Ship of the Year award by the Steamship Historical Society of America on May 19, 2012. Click here to see the award. Tucked behind a ruined grain elevator at a pier along an industrial stretch of Baltimore's waterfront lies a still-gleaming white vessel that was once one of the nation's proudest maritime achievements — the only nuclear cargo and passenger ship ever built in the United States. She's the N.S. Savannah, a floating time capsule from the mid-20th century that has made Baltimore her retirement home... Click on the link above to read the full article. This article in the Baltimore City Paper features the N.S. Savannah in her currnet Mobtown berth. She is touted as "Baltimore´s historic nuclear-powered ship is an overlooked gem". Click on the link to read the full article.